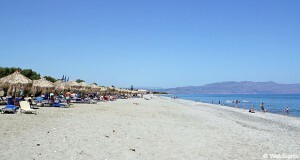 Kalathas is a seaside town in the north-western part of Crete on the peninsula of Akrotiri. 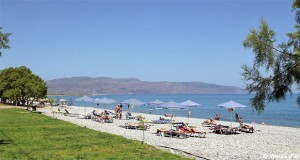 The town is located 12 km north-east of the much larger holiday resort Chania. The beach in Kalathas is beautifully situated in almost unspoiled natural surroundings with mountains, trees and a small island in front of the beach. The beach is approx. 200 metres long and quite wide. The sand is fine-grained and golden, whereas the water is very clear and shallow. It is possible to rent sun lounges and sunshades and there is also access to changing facilities, showers and toilets. You can park along the road behind the beach. A little more than 100 metres from the coastline, there is a small island that you can swim out to. A little south of the main beach, there is a small undisturbed beach with no facilities, see the below picture. 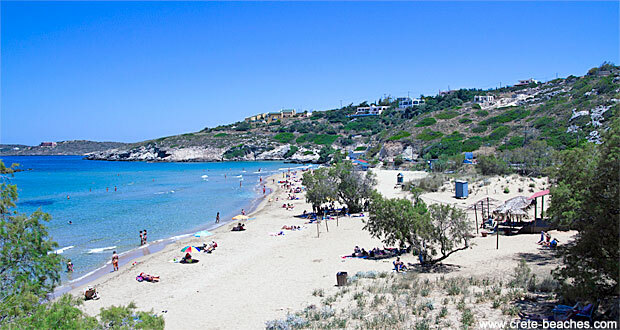 With its soft sand and very shallow water, Kalathas beach is very child-friendly. There are no water sports activities. There are two beach cafés, from which it is also possible to bring ice cream and drinks to the beach. Kalathas is a small and nice holiday resort, which is about to expand. There are some small hotels and it is possible to rent holiday homes. There are also two small super markets in the area, but otherwise the town’s greatest asset is the lovely and child-friendly beach.